Swangz Avenue top trending Singer Vinka is one of the artist that are always trolled by other fans on social media mostly because of her voice and slender body structure. However, according to her, she isn’t bothered about what dem say!! 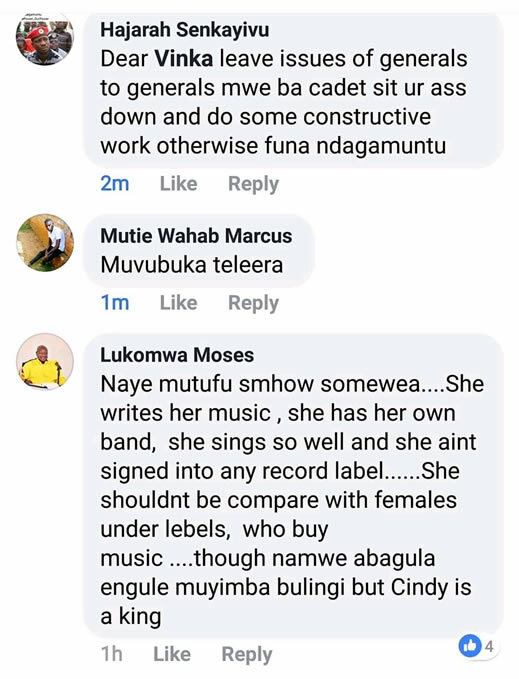 She was recently a point of Insult from mostly fellow female singer Cindy fans over her comments about the Sheeba Vs Cindy Sanyu music battle and her response to Cindy that she needs education first before uttering out her dumb opinions. This followed the ‘Ayokyayokya’ star referring to Vinka and other female musicians that are signed under music management groups as dummies. According to Veronica Nakiyingi (her real names), she is used to and no longer bothered about what fans ill references to her as long as she doing good musically. “Am not bothered because since the start of music career, they have been abusing me. Many say that am a man because of my voice,” she said. Vinka continued to reveal that she has always respected and loved Cindy, from the days of ‘Kwekunyakunya’ at a time when she was in her senior four. She added on that she is ready witness Cindy’s battle with Sheebah on a front seat. “I’m ready to pay for a VIP table, watch the show until the end because those two ladies inspire me, ” she concluded.